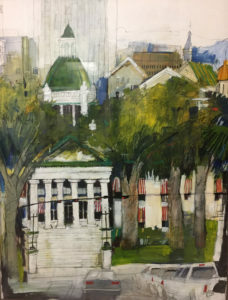 The Florida Historic Capitol Museum invites resident Florida artists to submit works for an exhibition in the state’s Historic Capitol building. The theme Capitol Reimagined will be the focus of the show. Capitol Reimagined celebrates the 40th anniversary of both Florida’s decision to save the Historic Capitol, as well as the inaugural legislative session in the current Capitol building. Artists are asked to creatively reimagine a Capitol of the future. Applicants are encouraged to research the history of Florida’s Capitol Complex and civic architecture and envision the future of Florida’s Capitol from our 2018 vantage point. Resources and more information, including media categories, can be downloaded below. Interpretations of the theme should reflect on the historic foundation for Florida’s physical seat of government beginning in 1821, through all modifications, including the initial construction of Florida’s modern Capitol Building in 1978 and the ongoing current updates to the Capitol Complex. Artists must be a Florida resident over 18 years old to participate. New, emerging and established artists are all welcome to apply. Deadline for submission is April 1, 2018 at 11:59 PM. The following resources are a starting point to learn about Florida’s Capitol Complex.